A boy supported by Rainbow Trust Children’s Charity who has a genetic muscle wasting disease has stood for the first time using a frame, giving his mother fresh hope for his future. 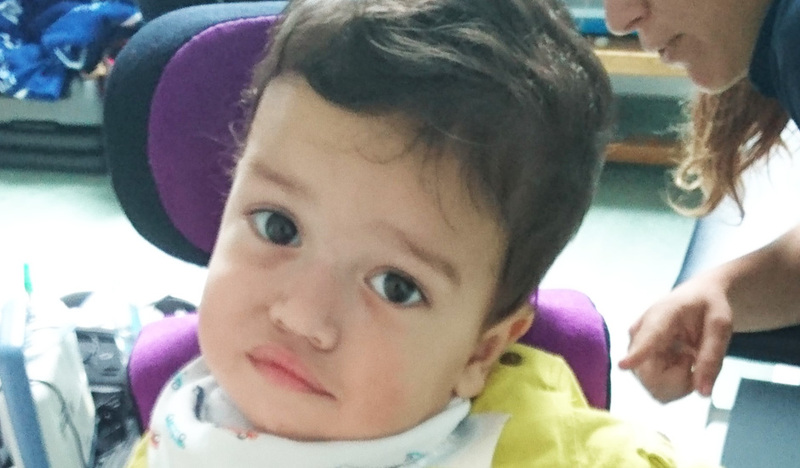 Little Hadi will be two in September and his mother Sanaa has shared their family story to raise awareness of Rainbow Trust and to highlight Spinal Muscular Atrophy Awareness (SMA) Month, which is in August. Hadi was diagnosed with SMA Type One when he was eight weeks old. The disease affects all the muscles in his body because he is missing a protein called SMN. He is tube fed, unable to swallow or to sit up unaided and can have difficulty breathing. But Sanaa says his symptoms have improved since taking his medication, Spinraza, which replaces the missing protein and which is administered through an injection in his back every four months when the protein starts wearing off. “Hadi is one of very few people in England who has access to Spinraza,” she said, adding that when he first started taking Spinraza, aged four and a half months, he was one of around only 17 other children in England with SMA type one who had access to the treatment. “Hadi was totally floppy by the age of eight weeks and he is getting stronger and stronger because he is taking new treatment. It was a great comfort to Sanaa that Hadi also seemed to enjoy the experience. Initially the family had to travel back and forth to Paris every fortnight for the injection but Hadi now receives it at Great Ormond Street Hospital, London. When Hadi was diagnosed, Sanaa knew immediately that she would need additional support outside the family because her husband travels a lot for work. Rainbow Trust Family Support Worker, Vilja, from the West London Care Team has helped the whole family a great deal in coping and coming to terms with Hadi’s illness. “I feel so reassured and so much better after speaking with Vilja, she is so supportive, as good as my counsellor,” she said. Sanaa doesn’t drive, so Vilja drives them to hospital appointments. She also occasionally takes Hadi’s older brother to school and drops Sanaa at work. Sanaa does not know what the future holds for Hadi but she said the complex condition can have a big effect on quality of life depending on which type of SMA someone has. She highlighted the importance of raising awareness of SMA and Rainbow Trust. “Whenever I come across a struggling family I always mention Rainbow Trust because they do all they can to support families,” she said.